WECREATE Center Pakistan is serving as a community center for women entrepreneurs and females interested in technology or expanding some existing business. The Center provides mentoring, business connections, specialized training, connections to the community, media attention, access to markets and capital along with the technical tools and resources necessary for taking any business to the next level. 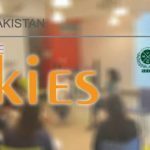 Recently WECREATE Center has taken an initiative to launch WECREATE talkies, a talk series to connect successful women from various fields of the society with young entrepreneurs who have a passion and quest for learning. The first session of WECREATE talkies is going to be held on 15th February 2017 at WECREATE Pakistan Center. The session is featuring Ms. Khalida Habib, Director for Education and International Relations for Security and Exchange commission of Pakistan. She will be highlighting the ROLE OF SECP IN ENABLING STARTUPS. The main aim of this session is to bridge the gap between SECP and StartUps by eliminating the intermediaries and brief startups about how SECP can facilitate them in their growth. This is going to prove a very beneficial session for entrepreneurs, professionals, academia and students as it is going to help them in network building and will provide guidance about the facilitation that SECP provides while going through incorporation process.